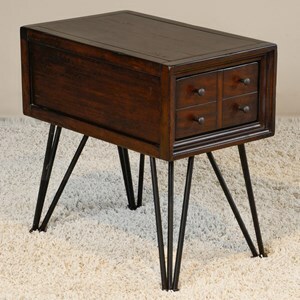 Apothecary-look drawer fronts and steel hairpin legs offer retro charm to this cocktail table. 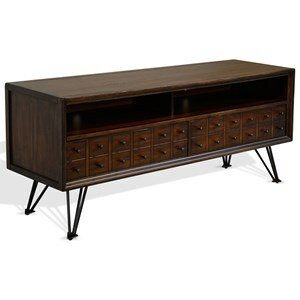 It is constructed from mahogany solids and veneers in a hand applied weathered pine glaze finish. 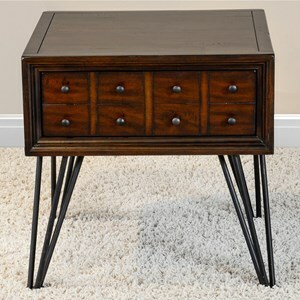 The Hampton Cocktail Table with Apothecary-Look Drawers & Hairpin Legs by Sunny Designs at Bennett's Furniture and Mattresses in the Peterborough, Campbellford, Durham, Lindsay, Haliburton, Bancroft, and Kawartha Lakes area. Product availability may vary. Contact us for the most current availability on this product. The Hampton collection is a great option if you are looking for Mid-Century Modern Industrial furniture in the Peterborough, Campbellford, Durham, Lindsay, Haliburton, Bancroft, and Kawartha Lakes area. 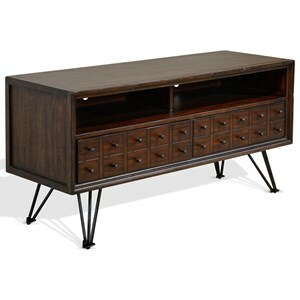 Browse other items in the Hampton collection from Bennett's Furniture and Mattresses in the Peterborough, Campbellford, Durham, Lindsay, Haliburton, Bancroft, and Kawartha Lakes area.